In designing your kitchen and bathroom, an important element is countertops. 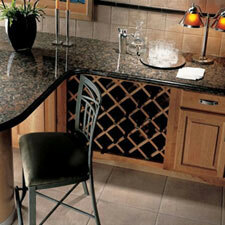 Kitchen countertops are functional and receive abuse from hot pans, knives, and spilled liquids. In the bath, counters are a resting place for hot curling irons, hair dryers, make-up and more. Countertops also offer an aesthetic value to every space. Design opportunities include backsplashes, and coordinated materials for your shower walls and tub surrounds. There are a variety of countertop materials available today and no material is best for all applications. This is especially true from a design perspective. Combining different materials in creative applications will enhance your space. If you are ready to move forward today and would like our help, please Contact Us at your convenience.